Joseph Coors, who used his brewing fortune to support President Reagan and help create the conservative Heritage Foundation, has died at age 85. Coors, whose grandfather founded Golden-based Adolph Coors Co. in 1873, died Saturday in Rancho Mirage, Calif., after a three-month battle with lymphatic cancer. In the 1970s, Coors began providing money and his famous name to start the Heritage Foundation, the influential think tank in Washington, D.C. Even earlier, he served as one of Reagan's advisers and backers in the "kitchen Cabinet," which financed Reagan's political career from the governorship of California to the White House. The two first met in Palm Springs, Calif., in 1967. "Without Joe Coors, the Heritage Foundation wouldn't exist — and the conservative movement it nurtures would be immeasurably poorer," the foundation's president, Edwin Feulner, said in a statement. In 1988 he retired as chief operating officer. He remained a director until three years ago. Coors used his chemical engineering background to refine the brewery's cold-filtered beer manufacturing system, which he created with his brother Bill. The brothers also initiated what is believed to have been the first large-scale recycling program by offering a one cent return on Coors' aluminum cans in 1959. Until the 1970s, Coors beer was sold in 11 just Western states. But aggressive competition from industry giants Anheuser-Busch and Miller Brewing prompted the company to expand. By the early 1990s, Coors was available nationwide. It is the third-largest brewer in the United States. But the company was the object of sometimes bitter criticism from activists who criticized Coors' politics and accused the company of a variety of violations of labor and environmental laws and bias against gays and other minorities. In 1977, labor unions launched a boycott after a bitter 20-month strike. The boycott ended 10 years later after the company agreed to forgo erecting legal roadblocks often used by management against an attempt to organize its workforce. The following year, Coors employees turned down Teamsters representation. Born in Golden on Nov. 12, 1917, Coors was educated in public schools. He graduated from Cornell University in Ithaca, N.Y., in 1940 with a degree in chemical engineering. His first job at Coors Co. was with the company's ceramics division, working in the clay pits west of Golden where the raw material for porcelain was mined. The porcelain business, purchased in the early 1900s, helped keep the company afloat during Prohibition, when the brewery produced malted milk and near-beer. 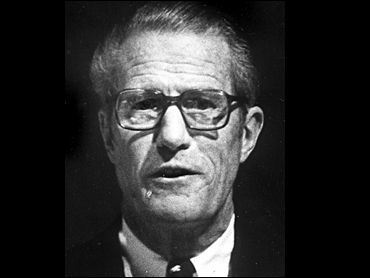 Coors also served a term as a regent of the University of Colorado, confronting what he saw as campus radicalism during the Vietnam War. Coors and his brother worked in the same office, their desks not more than a foot apart. But Bill Coors said their politics were quite different. "He was very principled and dedicated. But we got along a lot better if we didn't talk politics," Bill Coors said. "He was conservative as they come. I mean he was a little bit right of Attila the Hun. In addition to his brother, he is survived by his wife, Anne; five sons, Joseph Jr., Jeffrey, Peter, Grover and John, all of the Golden area; 27 grandchildren; and eight great-grandchildren.